So….. I was making a big ol’ batch of chili the other day so that we’d have food around the house, and made a tiny, yet terrible mistake. Usually I dump in a packet of chili seasoning, but I was out. I shook in some chili powder, then some ground cumin….. mmmmmm…..is someone making a cobbler? Dang it! That’s not cumin!! 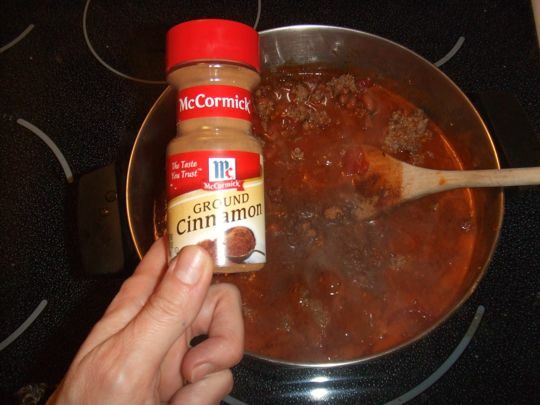 Drat those McCormick spices and their similar bottles and fonts! oh no! did it turn out ok?? Cincinnati chili always has cinnamon. We make a version of this, and it’s served with spaghetti! I’ve also heard of cinnamon in chili. Did you eat it? Charles is on his way back from an ALSS conference today, but he thanks you for the birthday wish. I’m very curious to know how it tasted. I thought it was good. I like Lauren’s normal chili better, but I would eat this again. In fact, there’s some more in the freezer, so I will eat it again. It had more of a “Southern” flavor than normal, but I really couldn’t taste the cinnamon as a separate ingredient. Oh…and Happy Birthday Charles! Are you another one turning the big 4-0? No, he’s 41. Apparently that’s too old to come to the computer and type this. My comment went bye-bye, and I’m not retyping it. Too bad, because it was really, really well-written. Pulitzer-prize-winning kind of comment.